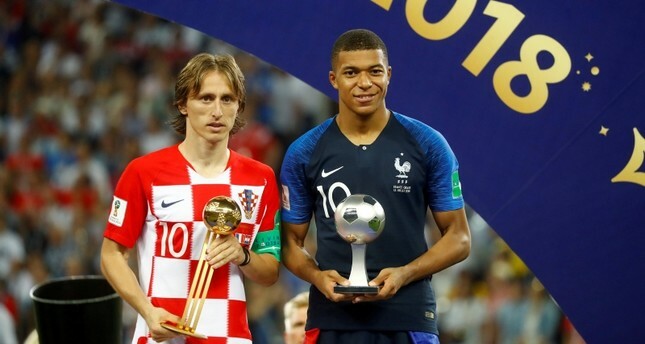 World Cup stars Kylian Mbappe and Luka Modric will lead the challenge against a decade-long dominance of FIFA's best player award by Cristiano Ronaldo and Lionel Messi. Mbappe, the teenage star of France's World Cup-winning team, and Modric, the Croatia captain who was named the tournament's best player, joined five-time winners Ronaldo and Messi among 10 candidates announced by FIFA on Tuesday. For the first time, FIFA has opened voting within days of the World Cup, where Ronaldo and Messi both exited in the round of 16. France also has Antoine Griezmann and Raphael Varane, who won a third straight Champions League title alongside Modric and Ronaldo with Real Madrid, on the FIFA list. Varane is the only defender selected by a FIFA expert panel which did not pick Brazil star Neymar. The 13-man panel included three Brazilians — former FIFA award winners Ronaldo and Kaka, and 1994 World Cup-winning coach Carlos Alberto Parreira. Belgium, which lost to France in the semifinals, has Kevin De Bruyne and Eden Hazard on the shortlist. It is completed by World Cup golden boot winner Harry Kane of England and Mohamed Salah, the Egypt forward who was inspirational in Liverpool's run to the Champions League final. The winners announced in London on Sept. 24 are voted by national coaches and captains, plus media from FIFA's 211 member countries, and fans voting online. Three finalists will be announced before the ceremony. France could sweep the main awards with Didier Deschamps and Zinedine Zidane heading 11 candidates for the best men's coach. Deschamps led France to the World Cup title, and his 1998 World Cup-winning teammate Zidane completed his Champions League hat trick with Madrid. Zidane, who has since left the club, won the FIFA award last year. The FIFA men's panel picked five World Cup coaches among the contenders: All four semifinalists — Deschamps, Zlatko Dalic of Croatia, Roberto Martinez of Belgium, and Gareth Southgate of England — plus Russia's Stanislav Cherchesov. Pep Guardiola is nominated for leading Manchester City to a runaway English Premier League title win. Guardiola won the 2011 FIFA award when coaching Barcelona. The other nominees are: Massimiliano Allegri (Juventus), Juergen Klopp (Liverpool), Diego Simeone (Atletico Madrid), Ernesto Valverde (Barcelona). In the women's player award, French and European champion Lyon provided six of the 10 candidates. The group includes captain Wendie Renard of France, plus Dzsenifer Marozsan and Saki Kumagai, the captains of Germany and Japan. Three candidates who play in the National Women's Soccer League are United States international Megan Rapinoe, five-time FIFA winner Marta of Brazil, and Australia forward Sam Kerr. FIFA's expert panel did not shortlist the past two award winners — Carli Lloyd of the U.S. and Lieke Martens of the Netherlands. Four women and six men are competing to be the best coach in women's football. The nominations include Sarina Wiegman, the 2017 winner who coaches the Netherlands, and Asako Takakura, who coached Japan to the Women's Asian Cup title. The male candidates include Reynald Pedros, who led Lyon to a Women's Champions League and French league double, and Brazil's Vadao, whose team won the Copa America Femenina. At the ceremony, FIFA will make awards to the best goalkeeper, the best goal, and a fan award.